It is a self-contained device with the necessary circuit intelligence to sense overcurrents, to time and interrupt the overcurrents and to reclose automatically to re-energize the line. If the faults should be “permanent” the recloser will lock open after a preset number of operations (usually 3 or 4) and thus isolate the faulted section from the main part of the system. Most faults on overhead distribution systems – perhaps as high as 70 – 80% are likely to be temporary in nature & last only a few cycles to few a seconds at the most. ACR with their trip & reclose capability, eliminate prolonged outages on distribution systems due to temporary faults or transient overcurrent conditions. 1. In substations as the primary feeder protective device. 2. 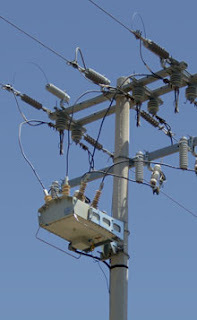 On the lines at a distance from a substation to sectionalize long feeders and thus prevent outages of the entire feeder when a permanent fault occurs near the end of the feeder. 3. On the taps of main feeders (lateral), to protect the main feeder from interruptions and outages due to faults on the taps. 4. Reclosers are available as padmounted units to provide simple, direct connections to underground cable systems. The recloser must have a voltage rating equal to or greater than the system voltage. 2. Maximum fault current available at the point of recloser location. The recloser interrupting rating must be equal to or greater than the maximum available fault current. The maximum continuous current rating of the recloser must be equal to or greater than the maximum maximum load current anticipated for the circuit. 4. Minimum fault current within the zone to be protected by the recloser. The minimum fault current that might occur at the end of the line section to be protected must be checked to determine that the recloser will sense & interrupt this current. 5. Coordination with other protective devices on both source & load sides of the recloser. Proper selection of time delays & sequences is vital to ensure that any momentary interruption or longer outage due to faults is restricted to the smallest possible section of the system. The ground fault settings ( minimum trip & timing) must be coordinated with the phase trip settings of the downline single phase devices like single phase reclosers & fuses.